Our Essential Myanmar tour is a great way for you to discover the mystique and splendors of this marvelous country . Your Myanmar package tour starts in Yangon, the country’s economic capital. Despite being the most bustling city, Yangon still exudes an intriguing charm with gleaming pagodas, picturesque lakes and vintage vehicles plying its leafy avenues. An orientation tour of Yangon’s downtown attractions, local teashops, Kyaukhtatgyi Pagoda’s reclining Buddha statue and the glittering Shwedagon Pagoda which takes on a magical aura at dusk, will definitely leave you in awe. Burmese Days is a delightful 5-day Myanmar tour program that immerses you in the essence of Myanmar. Traveling across the major cities of Yangon, Bagan and Inle Lake, you can expect to see a country that has not changed significantly since George Orwell’s famous classic Burmese Days. However, it is imperative that you discover for yourself Myanmar’s wondrous sights and friendly people in order to fully experience the charm of this captivating country. 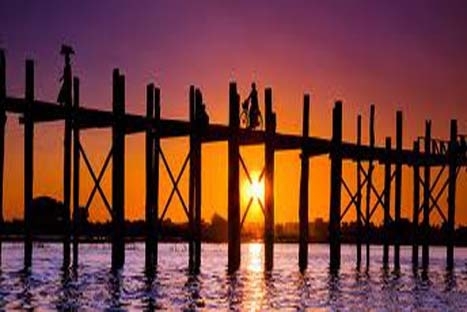 Your Myanmar package tour starts in Yangon, the country’s economic capital. Despite being the most bustling city, Yangon still exudes an intriguing charm with gleaming pagodas, picturesque lakes and vintage vehicles plying its leafy avenues. An orientation tour of Yangon’s downtown attractions, local teashops, Kyaukhtatgyi Pagoda’s reclining Buddha statue and the glittering Shwedagon Pagoda which takes on a magical aura at dusk, will definitely leave you in awe. 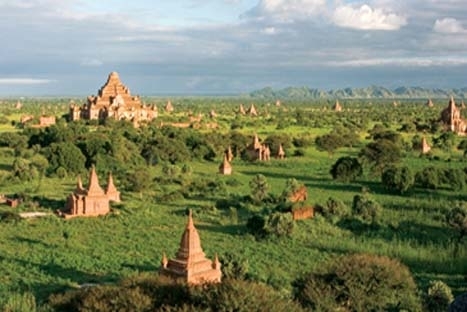 A short flight leads to Bagan, an ancient capital situated in Myanmar’s central plains. Dotted with thousands of pagodas and flanked by the mighty Irrawaddy River, Bagan constitutes one of Southeast Asia’s grandest archaeological sites. We will bring you to visit some of Bagan’s most iconic temples as well as a traditional lacquer ware workshop to witness the richness of Burmese culture and history. You will then fly to Heho, where a scenic drive through the countryside leads you to Nyaung Shwe, the gateway village to Inle Lake. Located in eastern Shan state, Inle Lake is a huge freshwater lake ringed by undulating mountains. On this atmospheric lake, you will discover tranquil villages on stilts, Inthar fishermen with their peculiar one-legged rowing skills, bustling ethnic markets as well as local cottage industries. Finally, fly back Yangon for another day of discovery in Myanmar. If time permits, enjoy a ride on the circle train to the city outskirts for a real taste of local life or stroll the cobblestone lanes of Bogyoke Market for Burmese souvenirs and artwork. This fascinating Myanmar tour will no doubt leave you with wonderful memories of your Burmese days long after the trip has concluded. If you are interested to learn about Myanmar in greater depth, we recommend you to visit the Golden Rock, a sacred Buddhist pilgrimage site near Yangon, or venture into the Delta to see the rural lifestyles around Yangon. Upon arrival, you will be greeted by your Exotissimo Guide who will accompany you as you transfer to the hotel. After lunch we’ll visit Kyaukhtatgyi Pagoda, home to a 70-meter long reclining Buddha. A visit to Kyaukhtatgyi provides a great overview of Buddhism with murals depicting the life of Buddha, the feet of the statue carved with traditional symbols and often many locals gathering to pay homage and pray. Continue to a local tea shop for a chance to experience an integral part of Burmese life: drinking tea! Select from an array of snacks and enjoy a coffee or tea as you sit amid businessmen, friends and families who gather at the tea shop to socialize or conduct business. OPTION:Make your own marionette! Visit a local craftshop, choose your marionette’s design (clothes, face, body) and make your own unique souvenir. The entire process takes around 1 hour and is suitable for adults and children. Supplemental cost of around 15 USD per marionette will apply. This afternoon, continue your tour of Mandalay with a visit to Kuthodaw Pagoda, whose 729 marble stone slabs of Buddhist scriptures have earned it the title ‘World’s Biggest Book’. Continue to Shwenandaw Monastery, the only remaining building from the 19th century Royal Palace. 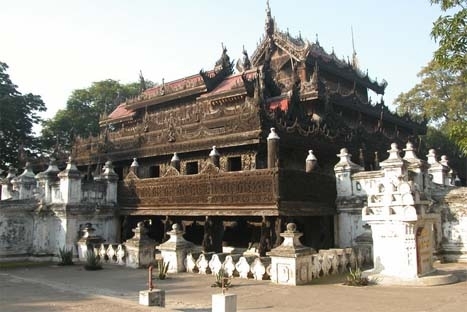 This grand teak building is known for its exquisite woodcarving. OPTION: Wake up early this morning (around 0400) and catch a local taxi to Mahamuni Pagoda. Every morning before dawn, the monks wash the face of the ‘lumpy’ Buddha image with special fragrant water and brush its teeth. The ritual takes around one hour and is a unique insight into Buddhism. (Approximately 5-10 USD per person without guide) Return to your hotel around 0730 for breakfast. After breakfast at the hotel, depart for an excursion around Mandalay to explore the former capitals of Ava, Sagaing and Amarapura. This morning, cross a bridge over the Irrawaddy River to Sagaing. Covered with 600 white-painted pagodas and monasteries, Sagaing Hill is widely regarded as the religious center of Myanmar. It is home to 3,000 monks and 100 meditation centers and you will visit pagodas such as Swan Oo Pon Nya Shin and U Min Thone Sae. Upon reaching the edges of Inle Lake, board a private motorboat to head out to Inle Lake, one of Myanmar’s most spectacular sights. Pass villages built on stilts over the lake, inhabited by the local Intha people. Observe the leg-rowing fishermen and see their floating gardens built up from strips of water hyacinth and mud and anchored to the bottom with bamboo poles. Visit Phaung Daw Oo Pagoda, the lake’s main sanctuary, which contains five sacred Buddha images covered in gold leaf. From the middle of the lake, continue down a small canal leading to the Pa-oh village of In Dein. Explore the area on foot, strolling around the village, visiting a local school, and wander through the beautiful Alaung Sitthou area. Alaung Sitthou is filled with picturesque ancient stupas and has magnificent views of the lake below. This morning transfer to Yangon Railways station to take a unique ride on the city’s circular train ride through the outskirts of town (20-30 minutes ride). This slowly traveling train gives you unique opportunity to observe the lively, colorful lifestyle of the local people. Disembark at the Kyi Myin Daing market where you can peruse the various stalls and interact with the friendly vendors before transferring back to Yagnon.